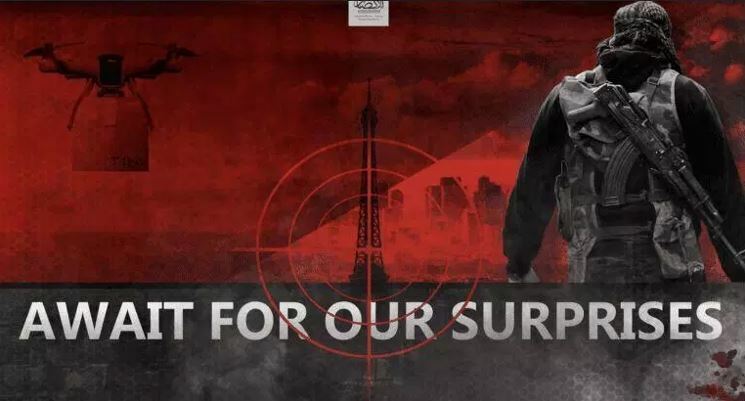 In the picture, a drone carrying a large canister appears together with the Eiffel tower, and an ISIS mujahid as the caption dubbed “await our surprises” is at the bottom. A brief history shows ISIS has been using drones for various missions as early as 2014, when the terror group used it mainly for reconnaissance missions. Starting 2017, ISIS has managed to a small grenade warhead (and see picture below as the warhead as in red). Weighing about 200-300 grams, the warhead is to be mounted beneath the drone (held by a small crane) and drop it from an approximate height of 50-100 meters on ‘enemy’ forces in the battlefields of Mosul and Raqqa. 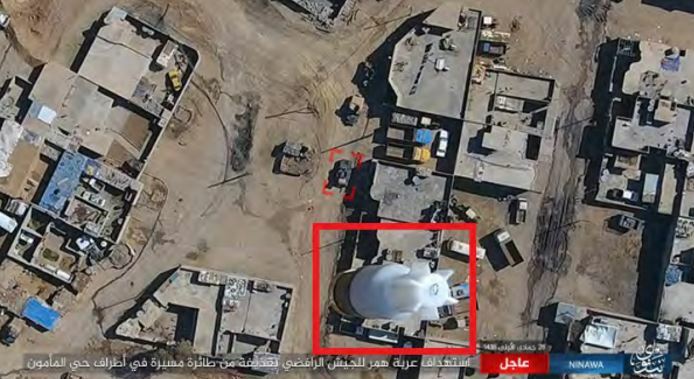 Various reports indicated that while such a small warhead did not cause major damage, it still inflicted casualties amongst ISIS rivalries and at least at Raqqa, the former ISIS capital in Syria. ISIS managed to launch 15-20 drone attacks a day, which brought about change in SDF fighting tactics, as they have started moving in the city from house to house, breaking walls rather than advancing in the open to the sky streets. On top of this most recent and direct threat to the Eiffel Tower, ISIS operatives were captured in Denmark a few weeks ago. They were trying to purchase drones to be sent to ISIS in Syria in Iraq. Phantom Technologies has been developing and manufacturing an Anti-Drone solution for the last 5 years, providing a fast deployment, experienced solution against a looming ISIS existing threat.